We accept most types of dental insurance and as a convenience to you, we will help you process your insurance claims in order for you to receive the maximum benefit. We will also gladly provide dental x-rays and a written diagnostic report should your insurance company have any questions about the services provided. If you pay for your dental treatment in full, you will also receive a cash discount. 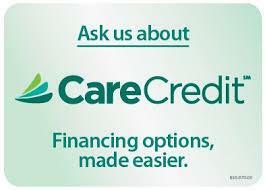 We accept all major credit cards, CareCredit, checks, cash, and offer long-term financing, if previously arranged. If you have any questions regarding your dental insurance coverage, our payment options, or financing, please don’t hesitate to call and speak with one of our insurance coordinators. We’re more than happy to help!